Haskell winner Bayern will contest the upcoming Travers. Photo: Bill Denver/EQUI-PHOTO. A little more than two months after California Chrome’s failed attempt at the elusive Triple Crown in the Belmont Stakes, a field of 10 3-year-olds will bid to win the G1 Travers Stakes, known as the “Mid-Summer Derby.” While owners and trainers yearn to see their charge to be draped in roses, black-eyed susans, or white carnations, many a champion has been made in Saratoga Race Course’s signature race for sophomores – but not many of those horses have taken the coastal route to Saratoga via Monmouth Park’s G1 Haskell Invitational. The field for the 145th renewal of the Travers will include smashing wire-to-wire Haskell winner Bayern. It also will include the winners of the G2 Jim Dandy (Wicked Strong also captured the G1 Wood Memorial), the G1 Belmont Derby (Mr Speaker), and the G1 Belmont Stakes (Tonalist). The bulk of the field includes horses who have run in the last 28 days, with the majority having run at Saratoga. The Jim Dandy has been the chosen prep for the last four Travers winners (Alpha dead-heated with Golden Ticket in 2012). It has been the most productive prep race for the Travers Stakes during the last 15 years, and two of the three favorites exit the Jim Dandy. When analyzing the performances of Travers participants and focusing on where they made their final starts before it, the lack of success that horses exiting Monmouth Park have had is striking. Bayern, who hails from the barn of Hall of Famer Bob Baffert sports tremendous early speed and had more than enough stamina to stay the course in last month’s Haskell, marking him one of the likely Travers favorites. However, in the 21st century, only one horse has pulled off the Haskell-Travers double. That was Baffert trainee Point Given in 2001, as he added those two summer G1s to a resume that included the Santa Anita Derby, Preakness Stakes, and Belmont Stakes, easily earning him 2001 Horse of the Year honors. Six horses since Point Given have tried to pull off the Haskell-Travers double, and none have been able to match that feat. The most recent of that group was Verrazano, who was beaten in the 2013 Travers as the 8-to-5 market choice. Coil, the 2011 Haskell winner, returned 27 days later in the Travers and wound up tenth at odds of 5-to-2, and Roman Ruler, the 2005 Haskell winner, was a well-beaten third behind Flower Alley in the Travers as the 2-to-1 favorite. Like Bayern, Coil and Roman Ruler both hailed from the Baffert barn. Bluegrass Cat (2006), Lion Heart (2004), and Peace Rules (2003) were the other Haskell winners from this period to fail in the Travers. 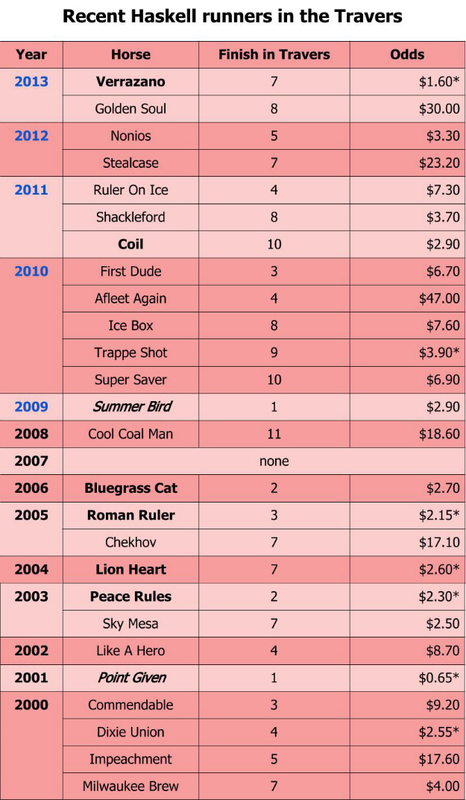 Since Point Given’s 2001 victory, 21 Haskell alums have started in the Travers. Haskell runner-up Summer Bird in 2009 was the only one of that group to win. He relished the sloppy footing that the field traversed five years ago, drawing off late in the handiest win of his championship season. By no means were the 20 horses who lost the Travers after racing in the Haskell rank outsiders. In fact, 16 of them sprung from the Spa starting gate at odds below 10-to-1. Further, five of them wound up going off favored in their respective editions of the Travers. In the last 12 runnings of the Travers, eight winners made their final starts before it in the Jim Dandy. While it can be argued that the Jim Dandy is a clearly defined “prep” race while the Haskell is more of a destination for the upper echelon of the division, this trend has developed in rapid fashion. Monmouth Park officials have been wildly successful attracting the highly regarded bigger names to their season’s centerpiece. The Haskell has featured the winner of one of the three legs of the Triple Crown in four of the last six years. Perhaps it is that level of attention to the Haskell that has precluded its participants from succeeding in the Travers. In 2009, Monmouth moved the date of the Haskell up one week so that it would be 27 days before the Travers rather than just 20. That change would enable more horses to contest both, and the change has been effective. Thirteen horses have run in both races in the last five runnings of the Travers, while just eight had done so in the prior seven years. Of the last twelve Travers participants that were exiting the Haskell, only one has finished in the money. That was the venerable First Dude, who also placed in the Preakness and Belmont Stakes earlier in 2010. To punters who prefer to stand against short-priced runners, Bayern will be viewed as an opportunistic speedster who parlayed a racetrack conducive to frontrunners with a slow pace to Haskell glory. Recent history suggests that his success on the Jersey Shore will provide him no boost in the Spa city.